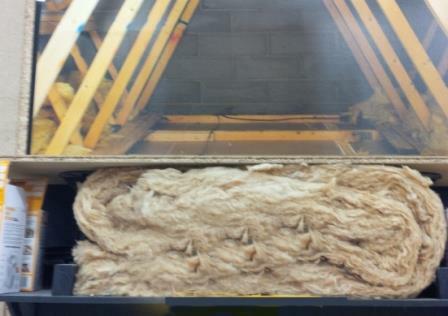 Blog Home > Insulation > What’s Wrong With This Loft Insulation? What’s Wrong With This Loft Insulation? In a certain DIY Shed website this brand is advertising loft boards and showing this picture of how the insulation is packed under the boards. 1. Insulation works in a loft by warming up the air that filters into the voids within the quilt. If the quilt is squashed, the insulation is useless. 2. Without any free flowing air over the top of the insulation the warm air will condense when it hits the underside of the floorboards. This condensation will soak into the boards making them unsafe. Even if the boards are moisture proof, the water will drip down onto the insulation, filter through the fibres because gravity means water will always find the lowest level, and damage the ceiling rafters or plasterboard underneath, and possibly both. You most certainly can do it . . . but it might be best to do it right. So, which National brand is promoting this damaging way of insulating a loft? We couldn’t possibly comment, but you might recognise the picture. See our DIY Project on how to fit loft insulation and for a project and tutorial video on installing loft insulation to the new requirements of 270 mm without losing your loft storage go to this Project about Store Floor.